Posted on December 13, 2018 by treelawyer	tagged. 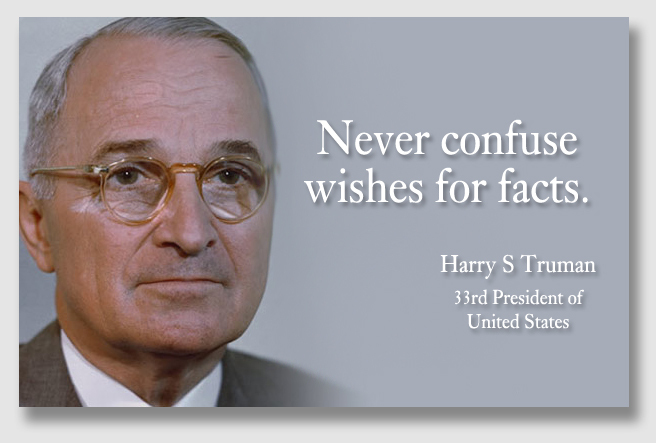 One of Harry S Truman’s favorite admonitions was that one should never confuse wishes for facts. In today’s case, Bill Johnson wanted to have the rights to use John Bradley’s lake so much that he convinced himself over time that he did have the rights. But (as another American president once said), “Facts are stubborn things.” Fact was, Bill didn’t own the rights at all. Up in Shawangunk Ridge country, John Bradley built himself a nature preserve, including rehabilitating an old dam and lake. 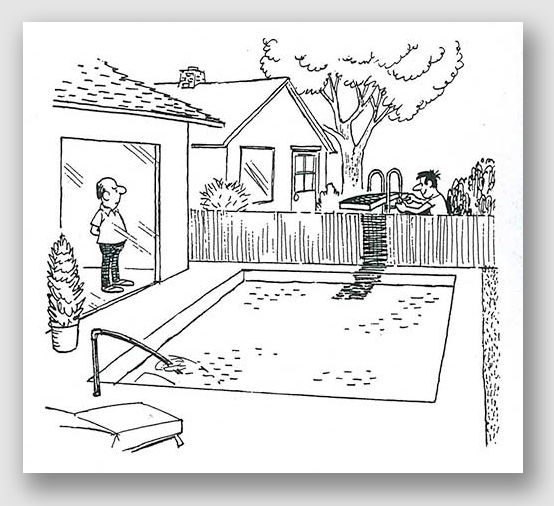 It was a pretty nice place, so nice in fact that his neighbor, Bill Johnson, found it irresistible. Bill had property that came within 10 feet of the lake, and he found it convenient to push the boundaries just a bit so he could boat and swim as well (the court opinion said he used it “for his boating and bathing activities,” and we’d prefer to assume that he wasn’t floating around with a bar of Ivory soap). Property owner Bradley put up fences, sent letters, threatened and cajoled, but nothing seemed to deter Bill from using the pond as an extension of his place. Johnson argued he had the right under the deed for his place that had been given to his predecessor in title, Miltie Quackenbush. That deed slapped a number of restrictions on the Johnson land, which included language that held no water rights in the lake were granted “except that the grantee named in this particular instrument and his or her family and the guests of his or her family are hereby permitted to use and enjoy the waters of Tillson Lake for fishing, boating and bathing.” Johnson took this language and ran with it (or swam with it). Unfortunately, the Court said Johnson was all wet. Johnson said the deed restrictions and covenants “ran with the land,” which means that they applied not just to Milton Quackenbush, but to everyone who ever bought the land after him. The Court disagreed. It said that a restriction or covenant was true where the deed language was unequivocal in doing so. Johnson’s argument sank because the fishing, bathing and boating exception — only one clause in a long list of restrictions and covenants — was clearly limited to the grantee “named in this particular instrument” — and that grantee was Miltie Quackenbush, not Bill Johnson. State v. Johnson, 846 N.Y.S.2d 671, 45 A.D.3d 1016 (N.Y.A.D. 3 2007). The Awosting Reserve was founded by John Bradley in the late 1950s as a nonprofit organization for the purpose of preserving the natural wilderness of the Shawangunk Mountains. In 1994, Ridge Lake Partners, of which Bradley was a member, bought property that later became Tillson Lake. Ridge Lake got permission from the Department of Environmental Conservation to repair a dam on its land and flood a portion of the property that had formerly been a lake. It did so, clearing, refilling, and safeguarding the newly formed Tillson Lake, including installing a metal fence around the lake and a posting of “no trespassing” and “private property” signs every hundred feet. The language of the grant further permitted the grantee “to use and enjoy the waters of Tillson Lake … subject to the rules, by-laws and regulations of the Tillson Lake Property Owners Association, which … may be changed, altered or amended at any time.” The final portion of the Tillson to Quackenbush deed stated that “the above restrictions, agreements and covenants shall run with the land.” Johnson said that since the time of his purchase, he has consistently used, mowed and cleared such strip in order to access Tillson Lake for his boating and bathing activities. Beginning in 1998, Bradley complained that he regularly saw Johnson trespass on Awosting’s land, cutting timber, mowing the grass and using the lake even after being told repeatedly that he was to leave. Since 1998, the lock on the gate nearest to Johnson’s property was frequently broken and replaced by a lock similar in appearance. In 2002, Bradley told Johnson to remove a dock he had built from Tillson Lake. Two years later, Johnson stacked firewood, parked his vehicle, planted grass seed and erected a wooden fence across a portion of Cherry Street, a private road owned by the Awosting Reserve. In 2004, the Awosting sent Johnson a letter telling him to get his personal property out of Tillson Lake. 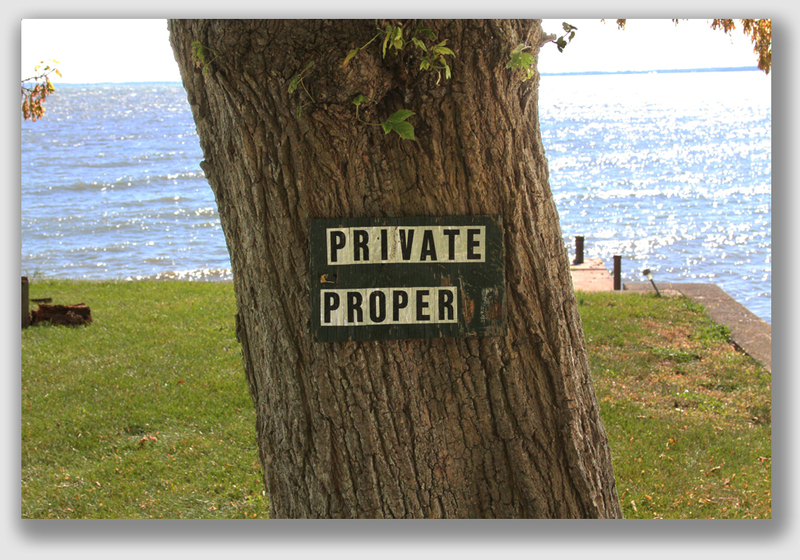 When none of these entreaties was successful, Awosting sued Johnson for trespass, seeking a permanent injunction barring him from entering the property or using the lake. 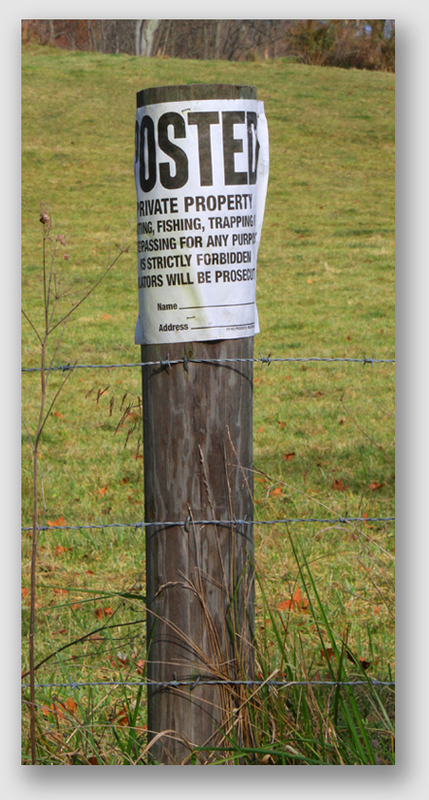 Johnson counterclaimed, asserting, among other things, easements by prescription and adverse possession. The trial court granted judgment to Awosting. Held: Johnson had trespassed, and an injunction issued barring him from further trespass. The Court rejected Johnson’s claim of an easement, holding that to create an easement by express grant there must be a writing containing plain and direct language evincing the grantor’s intent to create a right in the nature of an easement rather than a revocable license. The writing must unequivocally establish that the grantor’s intent was “to give for all time to come a use of the servient estate to the dominant estate.” If there is an ambiguity with regard to the permanency of the restriction placed on the servient estate, it is to be treated as a license or an easement in gross which is revocable at will by the grantor. Here, although Johnson said that the last portion of the Tillson to Quackenbush deed — which said that “the above restrictions, agreements and covenants shall run with the land” — created an easement entitling him to the use of Tillson Lake, the Court held that the license allowing the specific grantee to use Tillson Lake for boating, bathing and fishing was merely a temporary exception to the enjoining restriction which was intended to run with the land. Extensive record evidence established Johnson’s trespass both on the Cherry Street property, as well as Tillson Lake. Finding these acts to establish plaintiff’s prima facie burden of a trespass, the Court said, and it was up to Johnson to show that he had either a lawful right to enter these properties or had the owner’s permission. He did not do so.